A good flying club is structured in way that supports you, the pilot. HSP flying club offers exclusive socials, fly-ins, fly-outs, guest speakers, workshops, and more that will bring us all together to share our passion for aviation with each other, our friends, and our families. Becoming an HSP member is a statement about the kind of pilot you are. The HSP flying club has a high standard of safety and our focus is on the continual education, growth, and development of our skills and attitude in the aircraft. If you’re a hotshot pilot without humility, then this really isn’t the group for you. Each of us has a large amount of respect for what we do in the skies, the culture of aviation in general and each other. 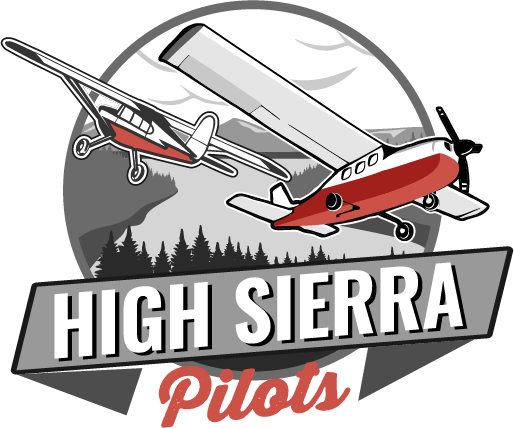 If you share those values then you’ll find no better home for yourself than the High Sierra Pilots. I grew up dreaming about flying, but never considered that it could become my reality. When I took the chance and went on my discovery flight, I instantly knew my life would never be the same. Since then, I've poured my heart into being a student pilot. I listen to pilot podcasts at the gym, I spend my evenings studying, and don't even ask me how excited I get when I pull up at the airport and know that soon, I'll be thousands of feet above the ground experiencing flight as only a student pilot can: with newfound joy. Flying has become my life, and I wouldn't have it any other way. In aviation, I have made some of the greatest friendships of my life and I invite you to come be a part of our HSP family, sharing knowledge, experience, resources and good times!